Changes in the aggregate price level can be traced back to changes in the underlying components. As the Federal Open Market Committee (FOMC) discusses the appropriate time for raising its short-term policy rate, considerable attention has been given to the current inflation rate. As mandated by Congress, one of the objectives of the FOMC is to maintain stable prices, which the FOMC has interpreted as being consistent with a 2 percent inflation rate. Inflation is defined as a sustained increase in the general price level of goods and services in an economy. One popular measure of the price level is the consumer price index (CPI), which measures the average change over time in the prices paid by urban consumers for a market basket of goods and services.1 This index can be broken down into smaller component indexes, each representing a different subset of goods and services. Hence, changes in the aggregate price level can be traced back to changes in the price levels of the individual components. Monitoring and interpreting changes in these component indexes can be difficult: There are many, and their underlying characteristics can vary widely. For instance, the water, sewer, and trash index has averaged a 5.11 percent growth rate over the past 10 years while the household goods and services index has averaged –0.23 percent over the same period. Volatility also varies across series, from the incredibly volatile energy series (with a standard deviation of 14.05 percentage points over the past decade) to the much more stable personal care series (with a standard deviation of only 0.75 percentage points). 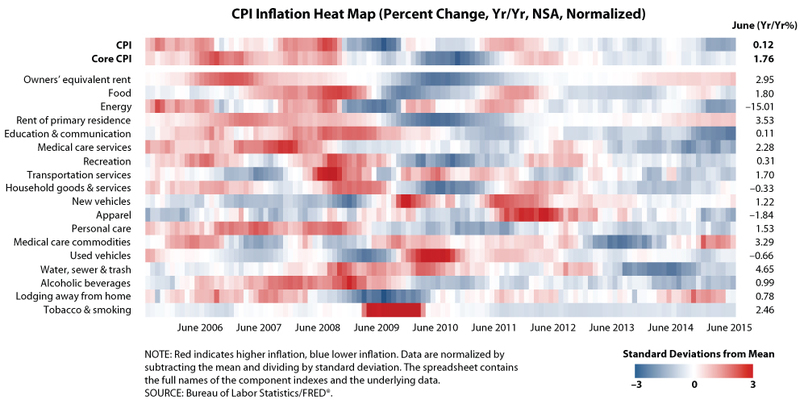 To simplify the analysis of these series, we developed a "heat map" that visually represents the relative inflation levels of various CPI components over the past 10 years. The heat map, shown in the figure, lists the components in order according to their weight in the overall index. Each colored box of the heat map represents the relative level of inflation for a given CPI component index for a particular month. For each component index, we define inflation as the year-over-year percent change in the index, which we normalize to take into account differences in long-term trends and volatility across series. (Series are normalized by subtracting the mean and dividing by the standard deviation calculated over the past 10 years.) Blue represents an inflation value below the long-term trend of the index, and red represents an inflation value above the long-term trend. The darker the color, the greater the difference between that particular inflation value and the long-run average for the component index (in terms of standard deviations). This heat map offers a fast and convenient way to keep track of specific inflation pressures. The last column of the figure reveals values from June 2015; one can see that most of the series are blue, including both headline CPI and core CPI. In fact, many of these series have been blue for the past several months, indicating that most CPI components have been growing persistently at a lower-than-average rate. These slow-growing components have contributed to the relatively low inflation currently seen in the headline and core aggregates. Indeed, June 2015 headline CPI inflation is especially low compared with its historical average, represented by its dark blue color. Of course, this may be disproportionately due to the recent deep drop in energy prices, an important component of the headline inflation measure. However, although headline CPI and core CPI inflation are running below their historical averages, a few components currently have relatively high inflation levels (indicated by red in the heat map), including a couple of series related to housing and the medical care commodities index. This pattern exemplifies how CPI components often don't grow in sync with the headline or core measures. That is, the growth rate of the overall price level isn't necessarily indicative of how the price levels of specific goods and services are changing. Note that, because we are comparing series against their long-run averages, it is possible for a "blue" series to have a higher inflation rate than a "red" series. For example, for June 2015, owners' equivalent rent is red, with an inflation value of 2.95 percent; water, sewer, and trash is blue, and yet has a higher inflation value of 4.65 percent. The reason is that the June 2015 owners' equivalent rent inflation is above its 10-year average of 2.16 percent; and the June 2015 water, sewer, and trash inflation is below its 10-year average of 5.11 percent. Aside from monitoring contemporary inflation pressures, the heat map also offers an interesting look at historical episodes of inflation, both aggregate and component-specific. For example, consider the row labeled tobacco and smoking. It is tepid for the most part, save for a very dark red segment from March 2009 to March 2010. During that time, year-over-year inflation for this component averaged a dramatic 26.8 percent. We found that this is likely the result of state tax changes in response to the recession. Changes to taxes on tobacco enacted in 2008 and 2009 brought in more than $2.5 billion of additional revenue in 20 states—which was 80 percent of all increased excise tax revenue during that period. 2 Graphing the data for this component index (through the St. Louis Fed's FRED® database, for instance) shows a persistent upward shift in the price level that matches what you'd expect to see from such an increase in tobacco taxes. We have constructed an Excel file of this heat map that provides the figure as well as all of the underlying data, which can be found in FRED®. You can automatically update the figure with the latest data by using the FRED® Add-In for Microsoft® Excel®. This will allow FRED® users to stay up to date on CPI inflation components. 1 While the FOMC's preferred measure of inflation is calculated from the price index for personal consumption expenditures (PCE), CPI is perhaps the more familiar and widely cited price index. 2 Johnson, Nicholas; Collins, Catherine and Singham, Ashali. "State Tax Changes in Response to the Recession," Center on Budget and Policy Priorities, March 9, 2010.